Lithium is known as “white gold” since electric cars require a lot of batteries. This has resulted in transforming the metal into a valuable and sought-after commodity. 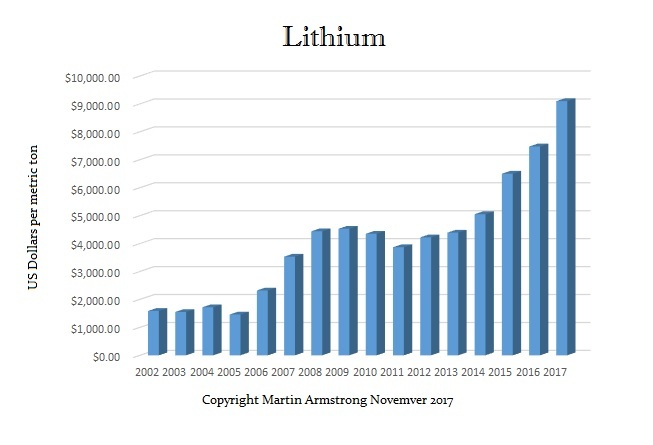 The demand keeps rising as there is a need for energy storage that can only be produced if lithium is available in sufficient quantities. The price has soared from $1,550 to $9,100 a metric ton. This interesting metal was once used as a treatment for brain disorders. It was also the title of a song by Nirvana for its effect on the brain. Lithium is often found in salt flats when water repeatedly evaporates from a shallow lake, leaving behind a crusty layer of salt minerals. Consequently, Lithium is unique because it is the lightest known metal. During the 1790s, it was a Brazilian naturalist who discovered the mineral called petalite on an island in Sweden. Then in 1817, a chemist in Sweden discovered that petalite contained a previously unknown element. He was able to isolate one of the salts, but he could not isolate the mineral itself. Nevertheless, he gave it its name – lithium, which meant “stone” in Greek. Finally, 1855 a British and a German chemist were able to separate the metal from the salts. Once this was accomplished, commercial production of the lithium metal began in Germany in 1923. Because it is so light, it is known for its wide use in batteries. The latest story involved a pair of exploding headphones on a plane. That incident came after the Samsung’s Galaxy Note 7 recall of their phones, which ended that line. You can’t chalk it all up to incompetence, either. At the famous Jet Propulsion Laboratory, a robot named RoboSimian blew-up thanks to a lithium battery. So what is so dangerous? Inside, there is a thin and porous slip of polypropylene that normally keeps the electrodes from touching. If that separator is breached, the electrodes come in contact, and things get very hot very quickly. So why even use them? Lithium-ion batteries are indeed the most efficient battery. They hold an amazing amount of energy in a tiny package that is light. They can keep a laptop running all day. They have been used in batteries going back 25 years ago by Sony. However, they seem to get more volatile as time goes on because we are pushing the envelope. We want lighter products to last longer and they have to be cheap. Devices containing lithium metal or lithium-ion batteries (laptops, smartphones, tablets, etc.) should be carried in carry-on baggage. Most airlines will not allow you to check them in baggage.